Good morning and Happy Sunday!! I not only have the recipe for this DELICIOUS Chicken Meatloaf Marsala but also a chance for you to enter to win a $500 Paypal Cash Giveaway! Yup, perfect timing to get some extra cash before the holidays roll in! SO be sure to scroll all the way to the end of the post and enter! This recipe is one I make often! I just love it and its so much easier then the classic Chicken Marsala. Meatloaf is an American classic but here I throw in some Italian elements and keep the traditional mushroom marsala sauce. It makes for a great family dinner! Served with some Garlic & Chive Mashed Potatoes, the veggie of your choice and maybe a bottle of wine. Chicken Meatloaf Marsala just may become a new favorite comfort food of yours too! Preheat your oven t 375 degrees. Place the ground chicken, bread crumbs, garlic powder, pecorino, eggs, salt and pepper to a bowl. Mix to incorporate the ingredients evenly. Form into a log shape on a lined baking sheet. Bake for approx. 25 minutes, until the chicken is cooked through. In a large saute pan over medium heat, add the olive oil, butter, thyme sprigs and mushrooms. Cook until the mushrooms get lightly golden. Add in the garlic and shallots and cook until softened. Season with salt and pepper. Add in the marsala wine and chicken broth. Whisk to incorporate the flour and to break up any lumps that may have formed. Bring to a boil then simmer for 25- 30 minutes. Allow the meatloaf to rest a few minutes before slicing. Pour the sauce overtop and garnish with fresh chopped parsley. A Dash of Sanity, The Love Nerds, Like Mother Like Daughter, Play Party Pin, Sugar & Soul, Tried and Tasty, Let’s Dish Recipes, Cupcake Diaries, Cooking and Beer, That Skinny Chick Can Bake, Recipe Runner, Happy Food Healthy Life, Love Bakes Good Cakes, Lady Behind the Curtain, Bread, Booze & Bacon, The Lemon Tree Dwelling, Cravings of a Lunatic, Food Folks and Fun, Our Mini Family, and Lemoine Family Kitchen. I never thought to try a chicken meatloaf – great idea. And I love Marsala sauce. What a delicious and unique twist on everyday meatloaf Angela! Love your giveaway too…wow! Great flavor combinations Angela, comfort food redesigned! 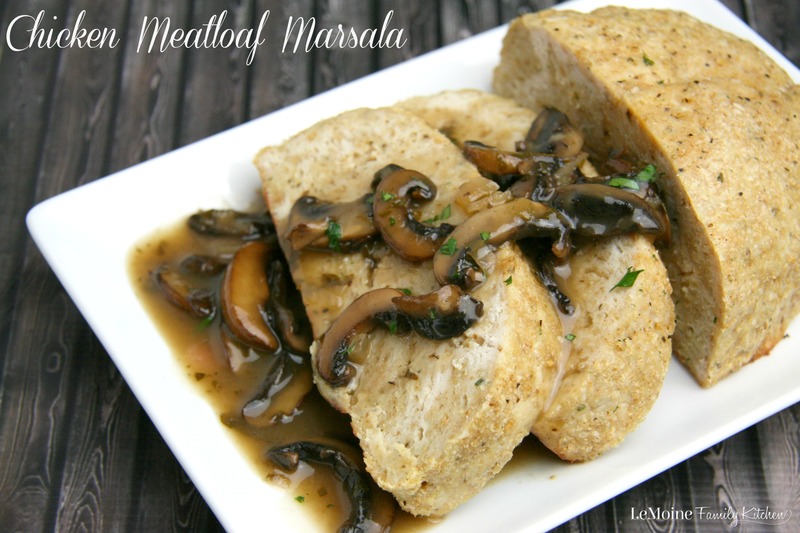 Chicken Marsala is one of my favorite meals so this is a must try! I’m with you, a great classic. This is a great twist on it and a lot easier too. Enjoy! I’ve never made a chicken meatloaf but I love chicken marsala so we will be trying this! This is a tasty one! Enjoy!